Dedicating his medal to all Indians, the country's newest Nobel laureate Kailash Satyarthi Thursday urged them to fight together against child labour and speak out against their exploitation - a responsibility that came with the high honour he shared. "This award is not mine. It belongs to the people of my country. The credit is yours; so is the responsibility to speak out and break the silence if you see violence against children around you," he said in his address to defence personnel amid the presence of army vice chief Lt.Gen. Philip Campose at Centre for Training and Development here. Saluting the Indian armed forces, the 60-year-old child rights advocate said he had immense faith in the soldiers who were serving at the borders to ensure the rest of India was safe but drew upon the urgency to secure safety of women and children who were vulnerable to multiple forms of violence within their own country.Satyarthi said as violence has multiple forms, an environment of fear is one such manifestation that victimizes women and children. "Our women and children live in an environment of fear, and that's also a form of violence. Where they are not safe, that country isn't safe either." He expressed concern over the trend of growing intolerance among the youth today that is resulting in violence.Education was the key for promoting the vision of global citizenship among them, he said, while impressing upon the need to act urgently.Satyarthi said knowledge is a basic right that is not available to many and, as such, monopoly over information and technology is a new type of crisis that the world confronts today. "Knowledge should reach out to most people in order to advance the goal of national development. Democraticisation of knowledge is a challenge that we must address," he said. 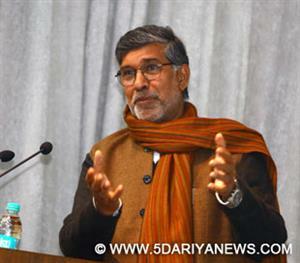 Advocating a safe India, a country where 13 children are stolen every hour as per the National Crime Bureau records, Satyarthi said people must join forces with the state and NGOs to forge an alliance against child labour and stand for their rights.He said the Nobel Peace Prize 2014, the honour he shared with Pakistani teenager Malala Yousafzai, serves to strengthen Indians who have the potential to bridge the moral deficit facing the world today.